The Egyptian weapons were wide ranged and varied, and the ancient warriors and armies of Egypt would employ multiple tactics to confuse and overcome their foes. 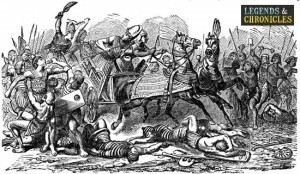 Fans of long range combat the Egyptian weapon choice reflects this, but not afraid of close quarter combat either, the Egyptian warriors would quite happily wield swords and axes too. Before closing the distance the Egyptians would use their long range weapons like the bow and arrow, spears, throw sticks and slings to pound their foes from a long distance. Once they Egyptian warriors had softened them up, they would consider their next move. 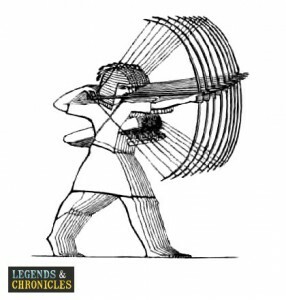 The bow and arrow was a primary weapon for the Egyptian army, during many periods and the Egyptians had multiple variations on this staple weapon over time. The early version of the bow and arrow were known as ‘horn bows’, and were actually created from the antlers of antelopes. Later the Egyptians would employ wood to construct their bows giving then a more flexible and accurate weapon to rain down arrows on their foes. Later the single body bows, would be replaced by composite bows used by the Egyptians, which allowed more range and power due to the increased flexibility of the composite bow structure, which melded wood with animal horn glued together. The typical Egyptian spear was short compared to other civilisation interpretation of the weapon at usually man height. While not their primary weapon, the spear still had a place in Egyptian warfare, the spear was suitable for ranged and close quarter combat. Often favoured by charioteers, who could use the spear to attack without running our of ammunition, like they would with a bow and arrow, the spear was an important weapon to many in the Egyptian army. The Egyptians were fond of the throwing stick, and of course they could use it as a weapon if needed. The throw stick is often depicted in ancient Egyptian hieroglyphs and was often used in hunting small animals. In war the Egyptian warriors would use the throw stick as a mid range weapon, and while unlikely to seriously injure an opponent, if the stick was to land on the head of their foe, it could cause concussion or a knock out. 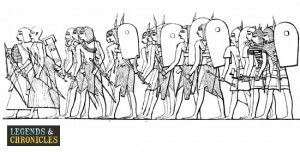 The Sling was a go-to weapon for Egyptian warriors, small, portable and usable at long and medium range, even close range, the sling provided a single projectile weapon that the Egyptians loved. Even a small simple weapon like the sling requires practise and skill and the Egyptian warriors were masters of this sling. While the weapon itself was not a primary choice, it would still be honoured by those that used it, and sling bullets made from lead would bear a mark. The Knopesh was the curved sword of choices for the ancient Egyptian. The Knopesh is a sickle sword and while not designed to cut with a push motion, was designed to slash the opponent. The Knopesh was commonly hooked at the end, which actually allowed it to be used to hook and remove an opponents shield in the heat of battle, a useful trait in a weapon, that allowed you to disarm and expose your foe. The Egyptian army if required would engage in close quarter combat, and the Battle-axe was one of their choice weapons. The Egyptians had two variants of this weapon, the cutting axe and the piercing axe, which both served their purpose at the time. The cutting axe was the first iteration of the Egyptian axe and was primarily effective against lightly armoured opponents. The piercing axe was designed later by the Egyptians to deal with more armoured foes, the piercing axe was intended to slice through armour causing more damage.